Caravan Stylist Studio, the celebrity studio at THE GREGORY HOTEL enlisted the help of the red carpet official spray tan experts FAKE BAKE to handle spray tans prior to the start of fashion week. Fashion insiders will be able to have a complimentary spray tan from FAKE BAKE on September 6th or 7th from 9am – 7pm and receive a goodie bag of items from some of Caravan’s favorite brands: OGX, ChapStick®, Color Club Nailpolish, Manuka Honey skincare, & tons of healthy beauty snacks: Volvic, RX bars, Luna Bar, Goodie Girl Cookies, Truth Probiotic Bars, and Shred Popcorn. If you are interested in visiting for a spray tan please email raffaella@caravanstyliststudio.com, or you can pop by between 9am – 6pm on Tuesday or Wednesday. Find out more about Caravan at www.caravanstyliststudio.com. The launch of the Gen Art Pop-Up in partnership with Bloomingdales SoHo. We will be hosting 8 days of events beginning Friday, September 9. Each day of the series will highlight a new designer, with creative activations and behind-the-scenes insight tailored to each brand. FREE food and drinks for fashion week attendees! 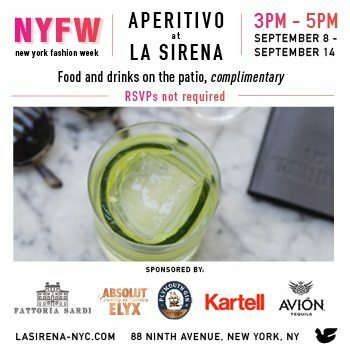 From 3-5 PM each day September 7-14, La Sirena, Mario Batali, and Joe Bastianich’s restaurant in Chelsea’s Maritime Hotel, will offer FREE wine, cocktails, and bites on its patio for fashion week presenters, attendees, and fans. Mark your NYFW calendars! Located in the Meatpacking District, 4 min. walk from MILK Studios, near Pier 59 and Chelsea Piers. RSVPs are not necessary. Just come on by for free food, drinks, and mingling! In the style of Italian Aperitivo, each drink will be accompanied by a small bite of food: pinzimonio skewers, sweet corn arancini, caprese skewers. 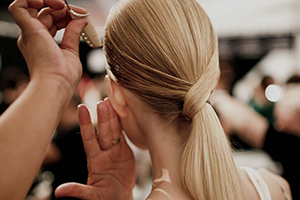 Food and drink will be made available to fashion week attendees at no cost. Located on the plaza level of Chelsea’s Maritime Hotel, La Sirena is an elevated trattoria serving breakfast, lunch and dinner daily. With nearly 120 seats on an open-air patio overlooking Ninth Avenue, La Sirena is New York’s ultimate destination for al fresco dining. The event is sponsored by Kartell, Fattoria Sardi, and Pernod Ricard, and will feature Absolute Elyx, Avion Tequila, and Plymouth Gin. Come relax from the craziness of NYFW between 3-5, every day! Bold, beautiful, slightly futuristic looks, unerringly cut. This interactive event will feature fashion tips with Tai Beauchamp, InStyle Magazine’s fashion expert and trend setter, and tips and how to’s from some of the most popular retailers at The Shops at Columbus Circle. Fashion and smiles meet in the heart of Manhattan. Healthy, beautiful smiles are the best fashion accessory for any season! Adventurous combinations and super-sumptuous fabrics. ACL PR & Marketing is hosting an inaugural New York Fashion Week pop-up event, in honor of the Paralympic Games on September 7th, 2016 (Brazilian Independence Day) from 6 PM to 10 PM at The Attic Rooftop in NYC. The event’s mission is to “Celebrate the Imperfections”, since the imperfections are what makes us beautiful! “I believe that the Paralympic athletes are the most inspirational, because they’ve taken what is considered to be a deficiency and turned it into a strength, making them a stronger person” says Jordana Guimaraes – founder of ACL Fashion Week. The event will be a pop-up installation showcasing fashion, beauty & lifestyle brands, embodying the vibe of the beaches of Brazil (since the Paralympic Games are taking place in Rio De Janeiro, with the opening ceremony on the night of the event). Guests will enjoy Brazilian sounds by guest DJ as well as scrumptious cocktails sponsored by LEBLON. BRAVO’s “Vanderpump Rules” cast members and others. All of these VIPs have assembled a video speaking of their imperfection and how it’s made them a stronger person, which will be showcased at the event. Click here to view one of the videos for the #celebratetheimperfections movement. There’ll also be a silent auction with brands from all over the world, and 25% of proceeds will go towards the She Lift foundation – founded by Sarah Herron of ABC’s Bachelor in Paradise & The Bachelor. For more information or to RSVP, please contact Jordana at acosmolife@gmail.com or visit www.aclfashionweek.com. Fine art as fashion. Or maybe fashion as fine art. Look for far-out explorations that somehow make sense.